Why this range is so wide? Many of us are often requested to provide some estimates to help people understand how much time or money they will need to invest. Regardless of how bad the intial situation might seem, I believe that we can always provide an estimate - there are estimation methods we can apply, and usually we have more information about the work that we thought we had. I also haven’t met anyone who was interested in down-to-the-dollar accurate estimate. It doesn’t matter whether they’ve come from waterfall or agile world, we always spoke in ranges. But even if we have a good understanding and apply an estimation technique, the results might not be very compelling to our team or stakeholders, especially when the estimate range comes in wider than expected (sic!). Some people might offer you witty advice to look at the work complexity and learn more about the requirements, but the complexity is only one of many factors that drive time and budget estimates. There are far more variables, and uncovering and approximating them can be only achieved by doing the work - this is also the best way to learn more about the complexity itself. I’m a big fan of Monte Carlo simulations when it comes to estimation. Regardless of whether you apply Monte Carlo or another statistical method, you’re most likely going to end up providing a time range. In most cases, this range will become the basis for your project budget, and this range might come in quite wide. 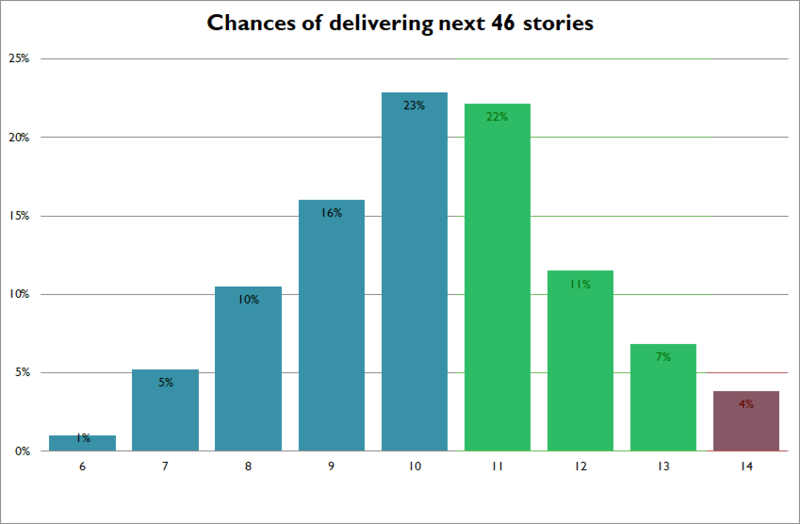 Let’s walk through a sample scenario of estimating a delivery time for 46 imaginary user stories. First, we go through the backlog, do the relative sizing, run simulated sprint planning to get velocity distribution and plug data into a simulation model. We look with hope at the screen, and the computer says - 7 to 14 sprints. The big temptation in our scenario is to figure out an acceptable contingency and narrow down the range near the average (possibly by using all the available power of wishful productive group thinking). We could return with a response that looks like the one below if we tried really hard, right? 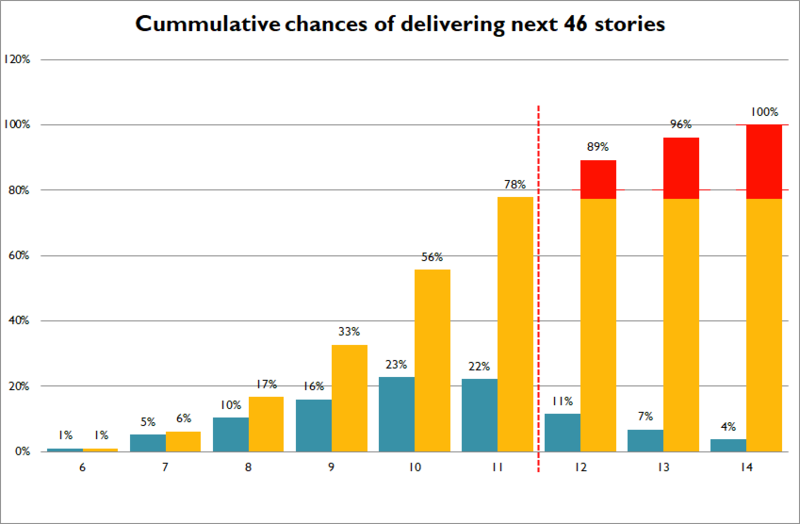 See the tails outside of the nice and narrow estimate - that’s where remaining 39% sits, and guess what - that’s a risk. You’re right, according to the model there is a 16% chance that it’s going to happen. But fair enough, let’s just talk about the right hand side. When I give you a 3 sprints wide estimate around the average, we’re betting on a game in which you can win 4 out of 5 times. How much money would you put on that if I only gave you one chance? Let me demonstrate it in a different way. If we missed the top bar of our estimated time or budget, which can happen 22% of the time after the 11th sprint, part of the work would not be delivered. There are many ways of dealing with this situation - we could actually remove something from the scope - but for the sake of the argument, let’s pretend the backlog consists only of must-have-compliance-or-we-get-sued items. The scope has to be delivered. How does it help with understanding the chances? According to our nice and narrow estimate, there is still a 22% chance we won’t finish the project on time. And even though the average says we should deliver in approximately 9 sprints, it’s close to 50/50. How much money would you put on a coin-flip bet? One approach would be to move the nice narrow range to the right side (because we need to give ranges, right) and present an estimate 11 to 13 sprints with a 4% risk. Theoretically, it’s a better approach, but in practice we’re bloating the estimate in true waterfall fashion: Team says $X; project manager (with experience) knows it will be closer to $2*X while project sponsor reaches for 4*$X to the pocket because it’s not the first time when the team and project manager has gotten it wrong. Yes, we have an ugly, wide estimate. It doesn’t make anyone happy and delivering such news is not easy. But we can deal with it. First of all, don’t be afraid of the ugly estimate - explain your estimation approach, complexity, known factors and potential sources of risks. There is always a good opportunity to review both the model and the method. If both of them pass the review, you’ll probably end up with few more people on board, ready to support you. A wise person once wrote “Project management 101: bad news doesn’t get better with time.” Delivering an ugly estimate is much easier in the beginning rather than end of the project. Secondly. Yes, today the estimate is ugly, but guess what, as we go through the project, we learn more about it. Base on this we can update the estimate with actual values and it will become more accurate (yay!). With cycles short enough, we will have enough time to react on these changes. Good news, it doesn’t look like it’s going to be longer than 14 sprints… There’s only 0.0001% chance. And what about the scope creep? What if the scope changes from 46 to 60 stories? Add them to the tail - not very likely - in this scenario nothing changes in terms of the estimation for the first 46 stories in the order we agreed on. We add and change priorities - almost every time - no problem, let’s crunch the numbers one more time. That’s the whole point, fixing estimates is like fixing a scope - it doesn’t help anyone. They have to be reviewed, monitored and updated to represent our best understanding of the goals. Regardless what your scenario is, it’s much easier to engage in a discussion when you have a model that tracks your estimates, and it is implemented as part of the delivery process. In a similar way we are implementing a model that helps track requirements in a form of the living artefact - a backlog. For sometime now I’ve been working on a pet project that helps me with home budgeting and acts as a training ground for learning new things. This time I was trying to experiment with Azure Data Lake Analytics to see if it can help with processing PDFs. Out of the box, Azure Data Lake Analytics supports CSV, TSV and text files. Content of these formats can be read line by line using EXTRACT expression and selecting one of available extractors. After installing Cognitive extensions we get an access to image extractors that support graphic files. In my case I wanted to scrape text from invoices and statements I receive electronically and process the data using ADLA itself. Given OCR being available in Cognitive extension, I initially though about rendering PDFs but it seemed like an overkill to me, especially when my PDFs have nicely organised text layers. I found a really good way of understanding how to write Azure Data Lake UDOs (YAY for TLA!) by using Visual Studio 2017 U-SQL sample unit test template, available if you installed Azure Data Lake tooling. This template creates a sample schema and test data for several types of custom U-SQL UDOs. What’s really cool, it’s not a simple scaffold for a unit test - instead it’s a complete example of how to work with and test your UDOs and how the input and output are being processed within your U-SQL script. I’ve created new C# class library for U-SQL app using Visual Studio template. Which pretty much creates C# class library project with two additional dependencies and Visual Studio support for registering the assembly as a U-SQL extension. After building and testing the extension (once again, big kudos to ADLA VS team who put unit test sample project). I was able to publish it to my ADLA catalog and try in the U-SQL script. Because I was using VS template for U-SQL class libraries, Visual Studio picked it up and enabled “Register Assembly” operation on the project. In order to use my extension in U-SQL script I had to reference both my assembly and its dependency. If you ever played with D3, you’ve most likely found https://bl.ocks.org - Mike Bostock’s site where he explains how to draw D3 charts from very basic to quite complex ones. On several occasions I followed his examples to draw charts on my sites. Recently, I started working on a TypeScript app and had to port JS examples to TypeScript. I used one of Mike’s samples here’s the histogram from his site to explain how to translate it to TypeScript and wrap in a form of an Angular2 component. This example follows the modular approach for D3 v4. Finding the correct module to import is a matter of going to D3 v4 API reference and finding which d3-x module contains types you need. When using TypeScript we need to specify types we use in generic classes. For the d3-array version 1.2.0 passing x.domain() as histogram.domain() argument, raises a type error. In order to use D3 to modify part of your Angular template DOM, you’ll need to use ElementRef to pass the template into your component code. This guide is created on a basis of Angular 2 - Quickstart. You can refer to the Angular2 - Quickstart guide to check exact contents of application and configuration files. On top of that I’m using Visual Studio 2015 Update 2. Given how quickly dotnetcore changes, some steps may look differently. Create a new ASP.NET Core Web Application project using Visual Studio. You should be able to see a similar folder structure being created. We’re going to use this folder structure when configuring Angular2 dependencies and the application itself. Angular2 Quickstart recommends using NPM to manage Angular libraries. I’m going to follow this recommendation. By default an ASP.NET Core application, similar to one we’ve just created, stores the front end files inside wwwroot folder. I’m going to keep it this way and use Gulp to move dependencies around and put them in a folder that will be automatically deployed with the web application. Inside gulpfile.js you will find paths variable. We have to modify it to keep source and destination folders of our new dependencies. The next step would be to use the destination folder, we just added to paths, and add a new clean task. This way Gulp will delete dependencies when we need to refresh our application. Now, we have to add the new clean task as a global clean task dependency. In order to move Angular dependencies from node_module folder in our project root folder to wwwroot folder we need to copy required files. After creating the copy tasks, we can group them so they will be more manageable. Now, we can create a new task we will use for publishing our front end application. It will run the default min task and copy-dep we’ve just created. From this point we can run gulp publish from the root folder of our project to update front end application files. In order to include our new gulp tasks in the Visual Studio build script, we need to modify project.json file prepublish scripts. At this point we should have all our dependencies put in the right place and we can start configuring Angular2 to build our application. In order to configure SystemJS we need to create a systemjs.config.js file inside wwwroot folder. I used SystemJS configuration file from Angular2 - Quickstart guide. However, in order to load files from a wwwroot folder it has to be modified respectively. Now it’s time to embed our Angular2 component in a Razor view so it will be served by the ASP.NET Core MVC application. In order to do it, we’ll modify the default layout file to load all the libraries required by Angular2. Inside _Layout.cshtml file, find the <body> element and replace it with the one below. For the purpose of this guide I’ll be using the home\index.cshtml view that is being load when we navigate to the root URL of our web app. In order to load your Angular2 component just simply replace the content of the home\index.cshtml file with snippet below. Do we really need it right now? Imagine a scenario - you’re surrounded by passionate people who love what they do, they are eager to try cool stuff and they quickly turn their visions into outcomes. Similar scenario - a development team that had been recently enabled and is taking an ownership of more things. They’re excited about doing things differently Not only in development but infrastructure, automation, process changes and everything else that they can put their hands on. Awesome! Right? Well, it depends. The question worth asking is: do we really need that improvement right now? - That’s cool, but it looks like we’re far away from our sprint goal and we made commitments. You’ve been there with us when we planned the sprint… BTW - Are you sure we need all of these now? - So, you don’t want me to work on improvements?! We need to improve things! Sooner or later we’ll need them! - So, should I drop what I’m doing? Guns still blazing, eyes full of passion, ready to show the latest improvement but… there is no one to listen… The rest of the team is busy with working on features, and they had more to do because one of their team members didn’t communicate about his ideas and plans. Sometimes working on features is not the most exciting things we do given all new tools and practices around us. However, we can’t use an improvement as an excuse from doing a work that the rest of the team committed to deliver. Also we can’t hide our commitments from the team. So, no improvements then? No! Improvements are one of the most important things in our work. We should keep questioning our status quo and look for opportunities to reduce waste and make things going smoother. However, we have to remember working on them adds up to team commitments. We can manage improvements with a backlog. Ideally it should be the same backlog that team uses for a product or their work stream. It will help with keeping things transparent and trigger discussions about a hypothetical value of each improvement. Also, they should go through refinements, prioritisation and planning - in the same way as other user stories. Improvements should have an owner and be prioritised. Once again, having a Product Owner who understands how technical improvements can glue with concepts like time to market would be awesome. Improvements’ owner should be capable of explaining a hypothetical value of implementing them to the rest of an organisation.